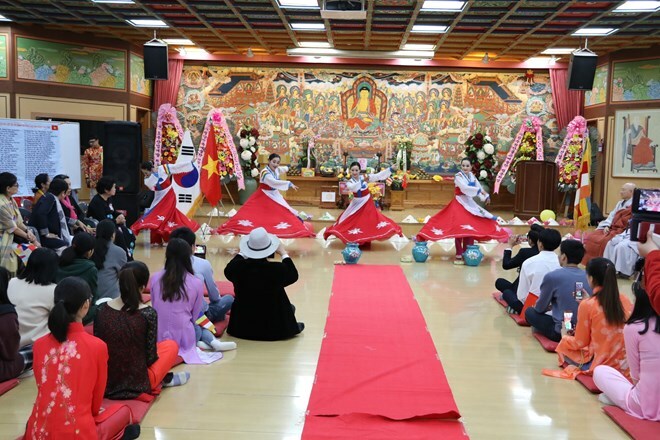 Seoul (VNA) – The Vietnamese Buddhist Association in the Republic of Korea (RoK) held a requiem at Phung An pagoda in Seoul on April 7 to pray for national peace and prosperity in Vietnam. Buddhist nun Thich Nu Gioi Tanh, Chairwoman of the association, said she hoped all Vietnamese Buddhist followers and expatriates in the RoK will live in peace, warmth and happiness. She voiced her hope that Vietnam and the RoK will live in peace, happiness and prosperity. Participants at the requiem also commemorated heroes and soldiers and those who sacrificed their lives to defend national peace, freedom, sovereignty and territorial integrity. Former Vice State President Truong My Hoa said though the Vietnamese Buddhist Association in the RoK has been established for more than a year, it has held a lot of activities to promote solidarity in the overseas Vietnamese community.